A NEW report published today examines 24 disturbing cases of abuse and neglect in Northern Ireland which resulted in children dying or being seriously injured. Poor communication between professionals, children not being listened to, a failure to act on signs of neglect and procedures not being followed are some of the concerns raised about how the children’s cases were handled before the key crisis event in each case. Four children died as a result of a physical or sexual assault. Six infants died unexpectedly for which there was no cause established (Sudden Unexpected Death in Infancy). Eight young people died by suicide or accidental suicide. They were all in the age category of 11 or older. Each of these cases was subject to a case management review – a formal process which takes place when a child has been seriously injured or dies as a consequence of abuse or neglect. The majority of the 45 children subject to a review were living in families where parents were experiencing difficulties with their mental health, alongside misuse of alcohol or drugs, and domestic violence. Academics from Queen’s University in Belfast joined with children’s charity the NSPCC to examine all of the case management review reports (CMRs) completed in Northern Ireland between 2003 and 2008 and they are publishing their key findings today. The new Safeguarding Board for Northern Ireland (SBNI) took over the case management review process in September 2012. The Detail can reveal today that four potential CMR cases have already been referred to the SBNI since September and, as a result, two further cases will be subject to review. One is a case of child neglect and the other centres on physical abuse of a child. Neither of the children died as a result of the abuse but the fact that the Safeguarding Board is progressing with a review means that it has concerns about agency care provided to these children. Non-accidental child deaths are rare in Northern Ireland but the number of homicides of children here does average around two or three every year. At 31 March 2012, 2,127 children were listed on child protection registers in Northern Ireland. Today we provide a breakdown of key information on the children who have suffered, we report on serious concerns raised about social services’ handling of their cases and, lastly, we examine changes to the important case management review process. From their introduction in January 2003 until December 2008, 24 CMRs were undertaken on 45 children. Twenty-seven were male and 18 female. A total of 18 children died and others were serious injured. The other children subject to review were siblings of those who died or had been seriously hurt or other children connected to the cases. None of the children subject to review are named in today’s report – which is entitled ‘Translating Learning into Action’ – and all identifying information has been removed. The overview report was commissioned by the Department of Health, Social Services and Public Safety to “bring together key learning” from all of the reports completed in Northern Ireland up to 2008. As well as the deaths and serious injuries, four of the CMRs took place because of concerns about inter-agency working and two were for ‘other’ reasons – one case where allegations of poor care were made against former carers and another case where concerns had been raised about the way that services had worked together. The table above gives a breakdown of the incidents affecting the 24 “index children” identified in the overview report. The index child is either the child who suffered most or, if this was not easy to determine, the youngest child in the family at the time of the situation or incident which triggered the convening of a CMR. 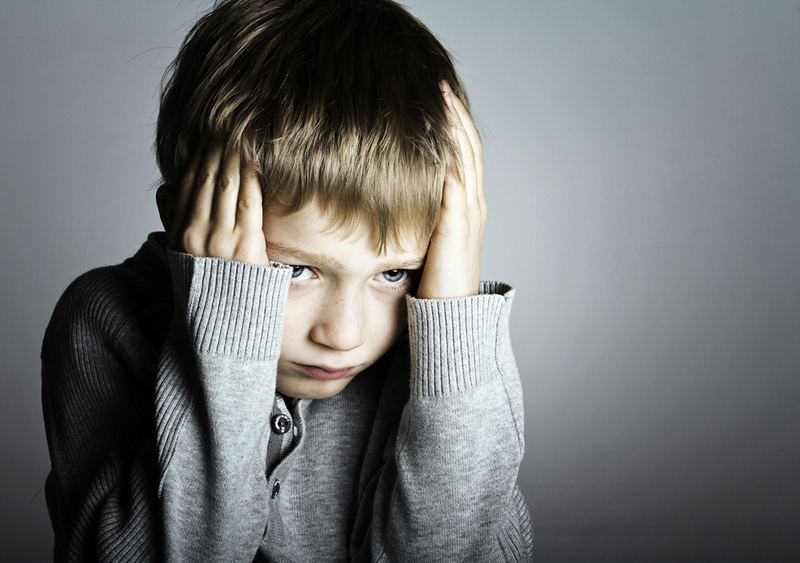 The index event may have been the endpoint of a lengthy period of adversity experienced by a child. Of the total 18 index children who died, seven were aged under 1, one was aged between one and five, one was between six and 10, six were between 11 and 15-years-old and three were 16 or older. 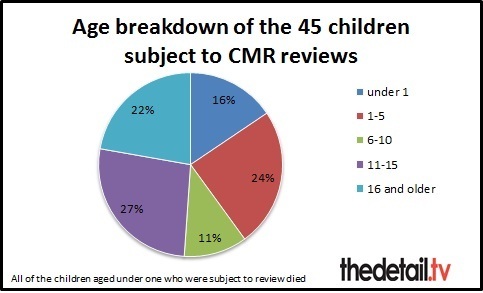 All of the children aged under one-year-old subject to review died. The youngest child subject to a CMR review died at birth while the oldest made complaints about the standard of care received in foster care. Three of the children in the oldest age category were adults but the review covered historical issues relating to when they were children. Five of the index children were the only child in the family, whereas for the remainder the number of siblings ranged from one to nine. The cases resulting in a case management review in Northern Ireland generally involved large families (defined as three children or more). We requested a breakdown of the ages of all of the 45 children subject to review. This information is in the chart above. CMRs aim to establish the facts of each case, assess whether there are lessons to be learned about the way in which professionals and agencies worked together and to provide better safeguards for children. The CMRs are not intended to be inquiries into how a child died or who was culpable. These issues are dealt with by the coroner and criminal courts. The overview report states that the majority of the children subject to a review were living in families where parents were experiencing difficulties with their mental health, alongside misuse of alcohol or drugs, and domestic violence. These adult difficulties often resulted in children being exposed to risks as a result of lack of care and supervision, a chaotic family lifestyle and inappropriate physical and sexual behaviour towards children by adults. Most of the index children were known to social services at the time of the event leading to the review – although only four were on the child protection register. These four children were all aged four or under and two died from sudden unexplained death in infancy. The reviews concluded that it was unlikely that the children who died or were seriously injured could have been identified as being at heightened risk. The research team had access to the full copies of all of the CMR reports but they do report that some important details were missing. For example, there was often very little detail about parents’ social history and also limited information about men in families. There was limited information in the reports about the family’s environment, for example whether they were working, the status of their housing and what their financial circumstances were. The type of housing tenure for the family was not noted in half of the CMR reports, in spite of the recognised importance of children’s environment on their development. In the cases where housing type was noted, eight of the children lived in accommodation provided by the Northern Ireland Housing Executive, one child lived in privately rented accommodation and the families of three children lived in owner occupied accommodation. A third of the families had a history of moving address frequently. Data was collected from each CMR report on whether any of a number of specified risk factors identified from the research literature as being associated with poorer outcomes for children was present. In looking at any illness or disability identified by professionals in relation to the index child, the most common disabilities were poor mental health and cognitive disabilities. Alcohol, solvent and drug misuse by the child were concerns in 11 of the reviews undertaken. As a consequence of these issues the children were often in receipt of services from a range of professionals and agencies, sometimes for many months and even years before the incident leading to the CMR. At the time of the index event children’s social services were involved with index children in 19 (79%) of the cases, with previous involvement in a further two cases (8%). This means that only three index children (12%) had never been previously known to children’s social services. One child’s case had been referred to social services but had not been allocated and a further three children had been allocated but not assessed. The majority (75%) had never been assessed as needing a child protection plan. Report author Dr John Devaney – senior lecturer in social work in the School of Sociology, Social Policy and Social Work at Queen’s University Belfast – is heading up the new case management review process for the SBNI. In an interview with The Detail, he said: “Most children in the review reports were known to social services at the time of the event which led to the case management review. However, it wasn’t that they were exceptional. “Quite often these children and their families were very similar to hundreds of families who are known to social services at any moment in time. “That is one of the challenges: how do you identify those children who are at greatest risk of very serious injury or possibly dying from all the hundreds of families being supported? “Most of the review reports concluded that the death of these children or their serious injury couldn’t have been predicted. Nine of the index children were either looked after at the time of the index event or had previously been looked after. 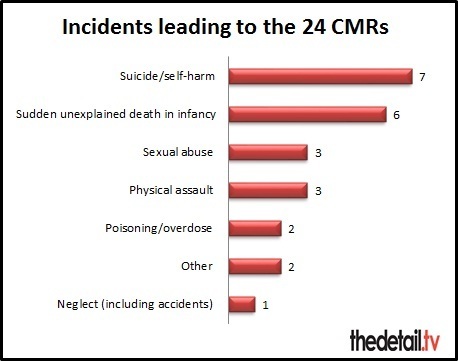 Four of the five children who were looked after at the time of the index event died as a result of the incident resulting in the CMR with three of these deaths related to self-harm or suicide. The four children who had been previously looked after were aged 13-years-old and above, of whom two died through suicide or self-harm. The majority of the children in the reports lived with their immediate birth family (75%) with mothers typically caring for 71% of the children. A high proportion of the adults with caring responsibilities towards children had issues relating to alcohol and drug misuse. A small but significant number had criminal convictions for offences ranging from unpaid bills to serious sexual assaults on children. Most of the case management reports provided very little background information on parents’ own childhoods, such as whether they had been known to child welfare services or been looked after in public care as children. This has been found to be a common weakness of review processes in both Scotland and England. The overview reports states that few CMRs showed evidence of early recognition of significant risk factors. See more on this issue in our second story. 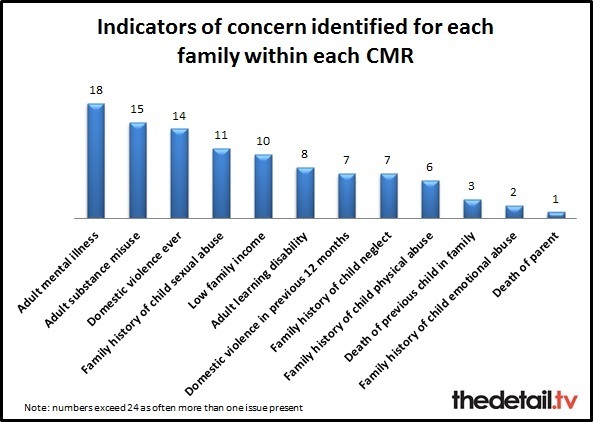 Dr Devaney said: “Similar to reviews which have been carried out in England, Scotland and Wales, what we found is that quite often the children who feature in CMRs are living in families where parents are struggling with their own difficulties. “There tends to be three or four main issues relating to parents’ own mental health, parents who misuse substances such as alcohol and to a lesser extent drugs and also families that are characterised by domestic violence between the adults living in the household. Health Minister Edwin Poots said: “I welcome the publication of this report, the first of its kind in Northern Ireland. It provides invaluable learning for the protection and safeguarding of children here. “Whilst we are all grateful that the number of child deaths have dropped dramatically over recent decades, the importance of the learning identified through case management reviews and the publication of this overview report cannot be underestimated within the context of a reduction in the number of children who are harmed or die. “The rate of non-accidental child deaths continues to fall. In my view, a strong child protection system has contributed positively to this reduction in numbers.